Ever wonder what it’s like to be a Top Chef? BravoTV.com wants to put your skills to the test with Top Chef Home Edition! Check out the weekly challenges, get inspired and share your dishes! 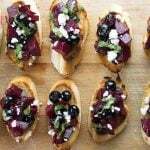 Thanks to BravoTV.com for sponsoring this post and for inspiring me to get creative in the kitchen with this beet & blueberry bruschetta. It’s no secret I’m a huge fan of Top Chef so when the folks at BravoTV.com asked me to help spread the word about Top Chef Home Edition it took all of a hot second to say “yes!” Here’s the deal: Each week there are new challenges and the opportunity to share your dishes with your friends using #TopChefHome. One of this week’s challenges is all about making a better bruschetta with fresh ingredients – want to join me? When I agreed to participate I did so before learning about the challenge, so I spent a few panic-stricken days wondering if I would need liquid nitrogen, or a sous vide machine, or if I would be subjected to rigorous Bucose d’Or type skills tests. Would foams be required? Would I have to recreate Hung’s famous quick-fire edible village scene made with items from the breakfast aisle? Or could I? Doubt crept in with the thought of turning a traditional bruschetta (a classic combination of fresh tomatoes, onion, garlic, and basil piled on toasted bread) into something new and unexpected. Oh, and share it all over social media. No pressure. So I did what any Top Chef contestant would do – I grabbed a notebook, a cocktail, my thinking cap and stayed up until the wee hours planning my better bruschetta. Why did the heck I use beets and blueberries? First, despite 90-degree temperatures outside, I’ve been roasting a whole lot of vegetables lately so beets immediately came to mind. I love their vibrant color and earthy flavor, but what to pair with them? I wanted something subtly sweet and fresh and it didn’t take long to get to the answer: blueberries. 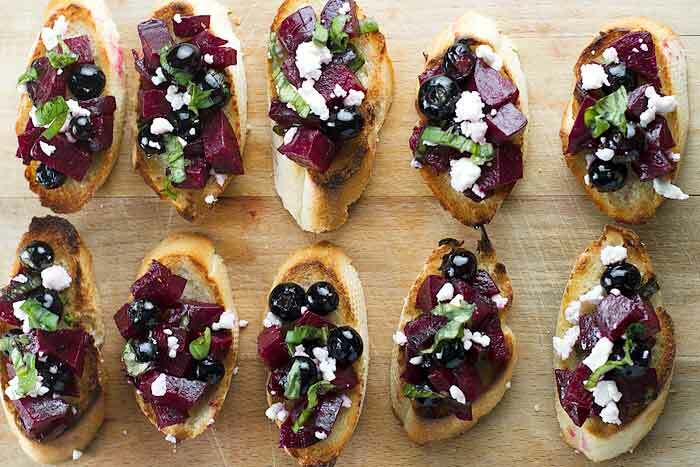 Blueberries make their way into all kinds of savory salads, so why not bruschetta? Isn’t it just a small salad on a slice of crusty bread? After that, the rest fell into place – olive oil and balsamic vinegar, crumbled feta cheese, and thinly sliced sweet basil. And there you have it: a plateful of colorful and delicious bites. 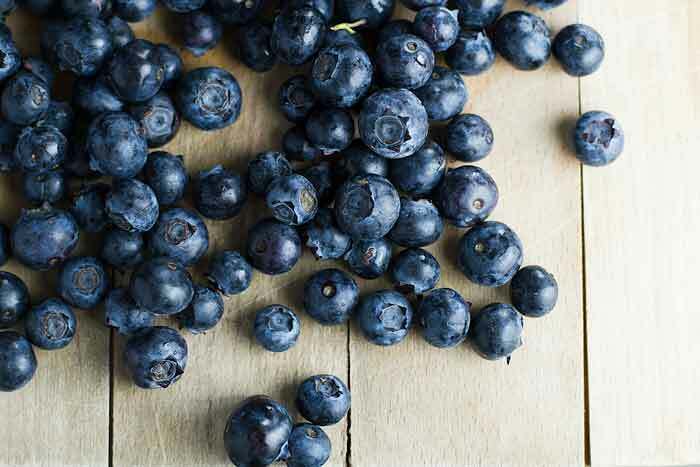 The beets and blueberries are an unexpected pairing and taste wonderful together – I think the balsamic helps tie them together as they both go really well with the tangy sweet vinegar. Success! So, what are you waiting for? Head on over to Top Chef Home Edition to get inspired and don’t forget to tag your photos with #TopChefHome – I can’t wait to see your creations! 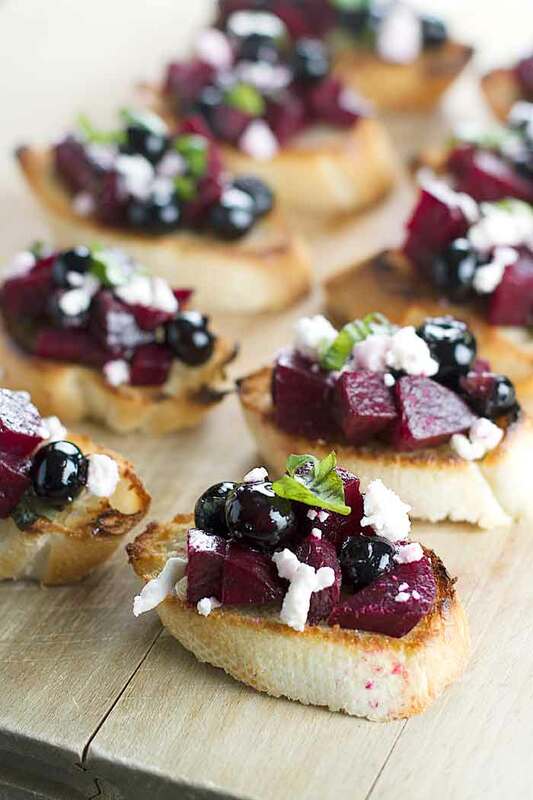 Roasted beets and fresh blueberries served on toasted bread. These summer bites are a twist on a traditional tomato bruschetta and are great for entertaining. Preheat oven to 425 degrees. Prepare the beets for roasting by first cutting off the green tops. Using a vegetable peeler, remove the skins and then cut them into equal pieces (halve the small ones and quarter the large ones). Wrap them in tin foil packets and drizzle olive oil over the tops – divide 2 tablespoons across the packets – before closing the packets. 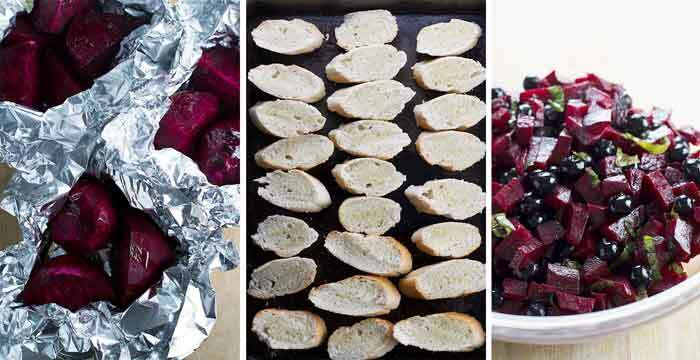 Place the packets on a baking sheet and roast for 45 minutes or until the beets are fork tender. Remove from the oven and let them cool. Dice each beet and place them in the fridge to chill. Slice the french bread into 1-inch slices. Place the slices on a baking sheet in a single layer. Brush each with some olive oil (you will need about 2 tablespoons total of oil). Turn the oven to broil and place the baking sheet on the top rack. Broil the slices until they turn golden brown – keep an eye on them because they brown fast! Once browned, remove them from the oven and set aside until you’re ready to build the bruschetta. In a large bowl mix whisk together the balsamic vinegar and a tablespoon of olive oil. Add the diced beets, blueberries, basil, and the salt and pepper. Toss it all together until everything is coated in the balsamic and oil. At this point, you can cover the bowl and chill it until ready to use (be sure to bag up the toasted bread!). When ready to serve top each bread slice with some of the beet and blueberry mixture. Sprinkle some feta over the top and additional chopped basil (optional). 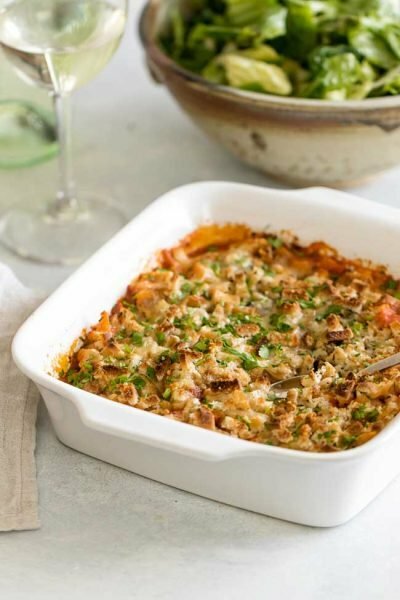 Drizzle with a little olive oil and enjoy! Beets are messy and I’ve found I like peeling them first before roasting to avoid the red juice getting everywhere. If you want to roast them first you can remove the skins after by gently rubbing them off. In either case, wear gloves if you want to avoid pink stained hands for a day. Nutrition estimates do not include the bread. Hello, I saved your beet blueberry awhile back, I have a girl’s night out tomorrow with us all bringing snacks, I am wondering can I use my canned beets? Hi Sharon, I haven’t tried it with canned but I would recommend draining the beets really well and make sure to chill them with the blueberries before serving. Okay…you have my vote! I love Top Chef, too! It’s by far my favorite foodie competition. I can see why they got you involved – perhaps they’ll do a Top Chef Blogger edition, someday… We eat our fair share of bruschetta in our house and I love your gorgeous take on it! I too am a fan of top chef so this is right up my alley! Love this bruschetta! I’ve never had beets before but have to change that! Yay, Top Chef!! 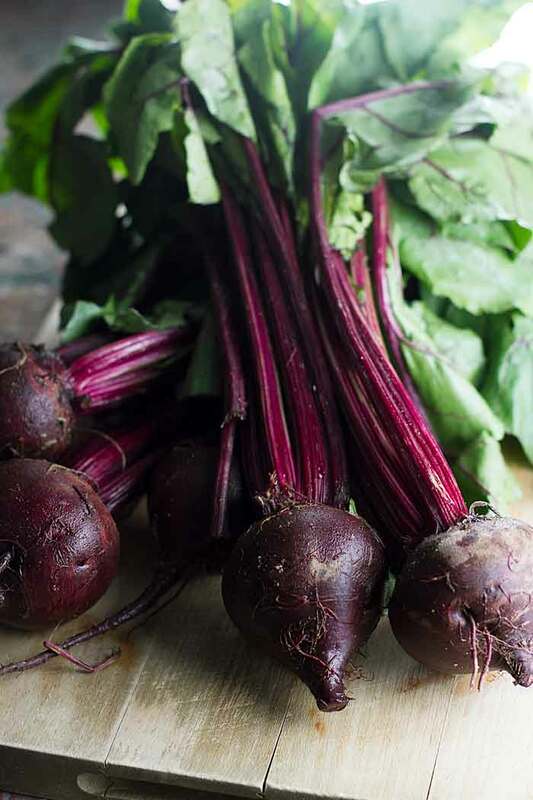 You have to try roasted beets — so good! You couldn’t have made anything I would like better than this bruschetta with roasted beets and blueberries. I love this idea! Thanks, Maureen – it’s a delicious combo! I used to watch Top Chef when I was in Toronto last summer, love all those cooking shows. Wow, April, this bruschetta looks amazing. I even planted beets this year, going to try this new bruschetta very soon. Beautiful photos. The color on this bruschetta is beautiful! It sounds like a great combination of flavors. I love how creative you got with this! I don’t watch Top Chef, but I watch Chopped from time to time. You do learn a lot and it makes you want to think out of the box more often when it come to your own cooking.